Um, hi everybuddy. Waffle here. The Boss put me in charge of the Saturday Photohunt today. How cool it is that the theme is Glow-Ball!!! I bet the Boss didn't even know I HAVE a glow ball. I got it for Christmas from my big brother, Gabe. 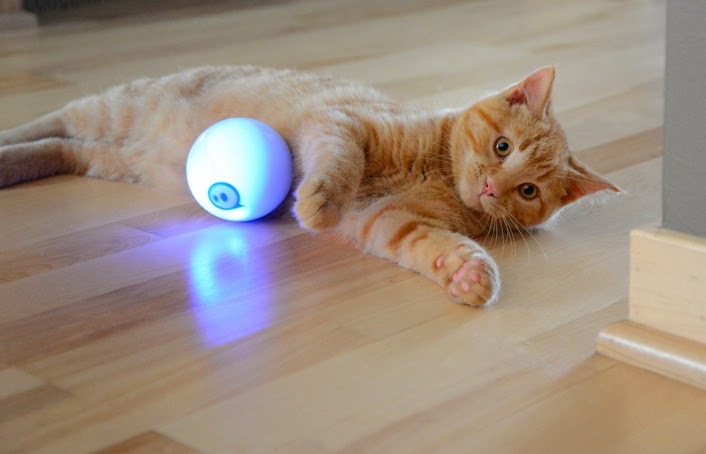 It's called a Sphero. 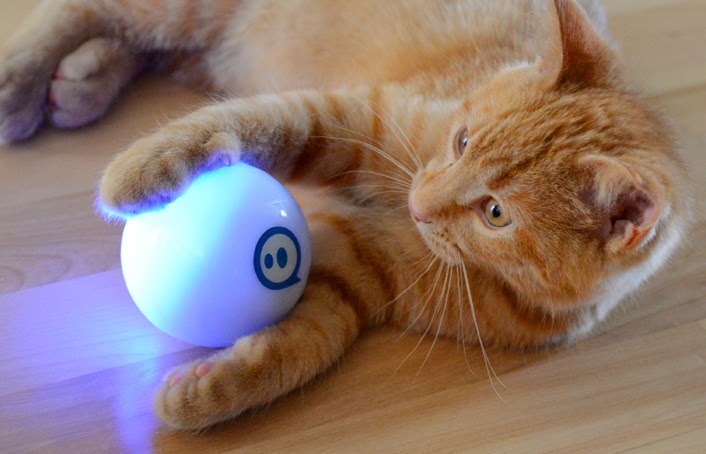 It's this really cool remote-control ball with glowing lights inside of it. Glogirly "drives" it with her iPhone. She's not a very good driver though on account of she gets it stuck in corners sometimes. 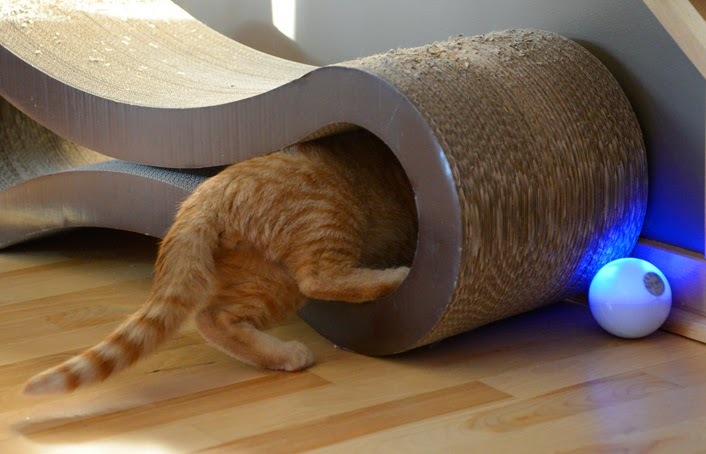 It's fun to catch and roll around with. But even if I grab onto it, Glogirly still holds the controls. You were chased by that ball?! That's horrible! MOL! Are you sure it's GloGirly or is it Katie?!? The horror, the horror. Can I borrow it? I keep telling TW, that's why you have tons more followers and that's why you're famous--and rightly so. Cos you can think of things like this and we can't. Totally brill! BTW, Pop bought home a promo glow ball from his last job. I didn't like it but I loved the golf ball. I can push it across the wood floor all night. Whoa! What a wild toy! I don't think we'd be terribly interested in it, although my human would probably have a lot of fun trying to make us like it! My Photo Hunt was a big FAIL this week, so I tried something different. You need to get control of the iPhone! We also think Katie is chasing you! Happy Caturday! Ut oh...we're not sure we would like toys that might chase us!! Wow W2 that is one cool ball. And man you can sure run like the wind. Oh Waffles!! When we saw what the Photohunt theme was this week, we thought oh dear... this is not going to be easy and we wondered what you would come up with. As per usual, you did not disappoint with your wit, charm, and humor. Of course, however, you have no idea that you are being witty, charming, and funny do you, Waffles?! Waffle, love that action shot! Waffle you are too cute. 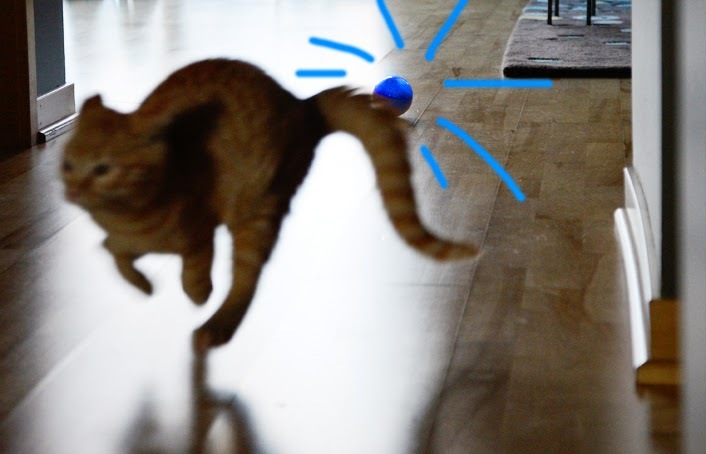 Waffles, we feel for you being chased by the ball. Cousins Shep and Earl have a Sphero, and our aunt brought it over to play. It chased us, too. Balls aren't supposed to do that! Way to think glow bally, Waffles! I've never seen one. Do they glow in the dark like kitty eyes? Sounds like a purrrrfect way to spend Caturday to us! MOL! We think Katie got ahold of the iphone, Waffles! Run for your life, W2! Yikes! A ball that chases you??? You sure that isn't Katie in disguise?? Toys that chase back? Not sure how I feel 'bout THAT. Hahahaha...I kinda want one of those. And then I want to sit back and watch the Woman torment Buddah with it. We donts think we'd a like a toy that chases us! But you sure is a fast kitty, MOL! That thing creeps me out a little bit. It kinda looks like a giant glowing eyeball. ::shudder:: Did you know your tailio is a full three inches long than mine?? But mine is FLOOFIER! Bwahahahaha! We love the "chase" pic! Allie: *raises paw* Uhm, after seeing that last photo...where can I order one? Waffles you are so cute I just can't stand it. You, your Glo-ball and your 15 inch tail! Now I want to get a ball for the Squeedunk Cats! Wow that sounds like an interesting ball!